From the start, Symon Castillo was always the best kid, according to his parents, Nate and Emma. He was a great listener with a big heart and loved music, having a great time, and hanging out with friends. Due to diabetes, Symon’s father suffered from worsening kidney function for years. When he was added to the kidney transplant list in late 2016, Symon immediately applied to be a living donor but wasn’t eligible at the time. In June 2017, Symon suffered a brain injury after a fall. After fighting hard for several days, the Lord called him home. It was then we were told Symon had registered as an organ donor, which is so fitting for the compassionate person he was, always helping others. Because of his selflessness, several people would receive the gift of life from his donated organs and tissues. In fact, Symon’s own father is one of those people – he received one of Symon’s kidneys. Today, we as Symon’s family, are hosting this campaign to keep his legacy alive and to share the importance of organ and tissue donation. 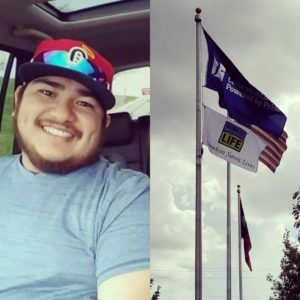 By joining the Donate Life Texas donor registry, you give hope to thousands of people awaiting the transplant they need to survive. Registering to become an organ, eye and tissue donor records your decision to be a lifesaving donor – just like Symon.